During winter months N.E Ohio temperatures can cause more problems than just rising electric bills and driving up fuel costs. 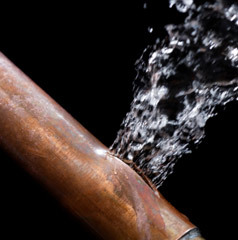 Pressurized indoor plumbing lines and connections exposed to extreme cold may expand and break releasing large volumes of water into attics, basements and living areas throughout homes. Within minutes water can travel from upstairs to downstairs, through walls, along foundation slabs and damage the structural integrity of residential and commercial buildings if not properly mitigated. These arctic type temperatures following a front can move into our region of Ohio and cause severe damage to homes & businesses. Water damage resulting from frozen/broken pipes can cause tremendous damage if not detected as well as potential serious health & safety risk if not mitigated properly.